You are to reign as a king in this life. This is your right and privelage as a child of God. Reigning as Kings is a practical step by step handbook that will empower you to rule in key areas of your life. Do you struggle with temptation, your flesh, or your thoughts? Do you lack the finances to accomplish God's purpose for your life? Does sickness or disease keep you down? Has un-forgiveness blocked your blessings? Do demonic forces prevent you from accomplishing God's purpose for your life? Using sound Bilblical principles and actual case studies, Pastor Jenkins will encourage and teach you how to begin your reign as a king, beginning today! No matter the size of your mountain or adversity, Reigning As Kings will equip you with the power to cast it into the sea. Begin your reign today! Get your copy of Reigning As Kings! Do you want biblical answers to these questions? If so, The Truth About America has been written for you. Pastor Barry Jenkins explains what is happening right now in our country and why. Then, he will explain step by step what we need to do to reverse the course. Read The Truth About America today and tomorrow begin to take back America from the forces that seek to destroy it! The Truth About America can be read in about 1 hour. It is designed to be brief and to the point. Our country needs Christians to stand up for righteousness and holiness and stop the wave of immmorality that is brought by the forces of darkness. It is not too late for the United States to return to its Godly roots. You may purchase a copy of The Truth About America for Five dollars US ($5.00) which includes shipping and handling by clicking on the "Missions" button on any page. For a $5.00 donation, a copy of this 60 page book will be sent to you. May God bless you as you stand for righteousness and holiness. Contact Pastor Jenkins today to order your copy. 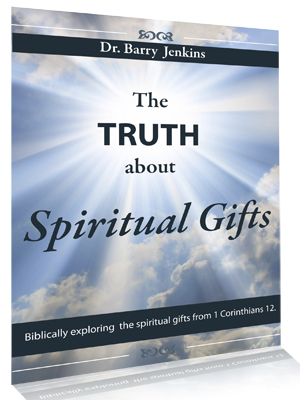 Have you ever had questions about spiritual gifts? Are they for today? Have they passed away? Is there a way I can know for sure? Can I learn how to prophesy from a seminar or class? Can the gifts be taught? Does the Old Testament standard of accuracy for prophets apply to the New Testament gift of prophecy? What is the function of each of the spiritual gifts? How can I know a genuine gift from a counterfeit?